Since 1948, when Sri Lanka became free from British rule, it has enjoyed a close and cordial relationship with Pakistan. Sri Lanka openly supported Pakistan during the Soviet military intervention in Afghanistan. During the Indo-Pak war of 1971, Colombo provided transit and refueling facilities to Pakistani war planes, knowing fully well that they will be used against India. The country also played an important role in the restoration of Pakistan to the Commonwealth.1 It was Sri Lanka’s resolve in 2009, to play cricket in Pakistan despite security warnings that helped prevent Pakistan’s isolation in the field of international cricket.2 The island’s team did face a terrorist attack in Lahore, though no player was killed or injured. A common strand in their relationship was highlighted by the Pakistan Prime Minister Shaukat Aziz during his visit to Sri Lanka in 2004. He said: “Our relations are rooted in antiquity, shared cultures, values and sense of common destiny. Pakistan and Sri Lanka thus needed to renew the multiple bonds of friendship.”6 However, notwithstanding the depth of their relationship, a question mark remains on the post-Liberation Tigers of Tamil Eelam (LTTE) era status of Sri Lanka-Pakistan ties. A bilateral trade agreement has existed between Sri Lanka and Pakistan since 1984. However, it was during the 9th session of the Sri Lanka – Pakistan Joint Commission meeting in Colombo on May 12-13, 2005 that the two countries for the first time exchanged notes confirming to each other the completion of the domestic legal procedures for putting the Free Trade Agreement (FTA) into practice. The groundwork was thus prepared and it was made operational as of June 12, 2005. Sri Lanka became the first country in South Asia to sign a free trade pact with Pakistan. Pakistan agreed to provide 100 per cent duty concession on 206 commodities, including frozen fish, vegetables, spices, fruits/juices, polymers of vinyl chloride in primary forms, natural rubber, raw silk, tanned/crust skins, wool, some varieties of paper and board, carpet and floor covering, non-alloy aluminum, iron and steel products and toys/dolls, with immediate effect. Likewise, Sri Lanka also waived duties immediately on 102 items, which include chickpeas, dates, oranges, benzene, toluene, apparel and clothing accessories, ball bearings, penicillin/streptomycin/tetracycline and their derivative and vacuum flasks. Of late, Pakistani businessmen have begun to look at Sri Lanka for its resource markets, especially after the fall of the Liberation Tigers of Tamil Eelam. Business opportunities beyond the Free Trade Agreement are being explored. The meeting of the first inter-governmental committee looked at the possibilities of including services sector within the ambit of the Free Trade Agreement.20 Besides, talks to sign a Comprehensive Economic Partnership Agreement (CEPA) to broaden the scope of the Free Trade Agreement were also in its last stages, though there have been some political objections from Sri Lanka. With India, however, no such progress in economic ties can be seen, although India has renewed its offer to revive Comprehensive Economic Partnership Agreement (CEPA) which aims at expanding cooperation in investment and services with Sri Lanka after the coming of the stable government in power. Opposition to Comprehensive Economic Partnership Agreement (with India) in Sri Lanka is on nationalist, rather than economic grounds (Liyanage, Sumanasiri 2010, 66).21 With Pakistan however, no such ‘fear factor’ is at work in Sri Lanka. In fact, Pakistan is the only South Asian country besides India with which the island republic has a Free Trade Agreement. Although trade figures are not very impressive, the pace of improvement is noteworthy. To which “agreed” Muhemmed Aejaz, Pakistan’s Trade Counsellor in Colombo, who viewed Sri Lanka-Pakistan Free Trade Agreement (SLPFTA) as more advantageous to the Sri Lankan business community than its agreement with India (Sri Lanka-India Free Trade Agreement (SLIFTA).22 The reason for this is that although with India, Sri Lanka’s trade has reached US$ 2 billion, the balance of trade is heavily in favour of India. The Sri Lanka-Pakistan trade also tilts in favour of the latter, still their economic relationship can be seen as a two-way process in which both the partners are equally contributing towards its success. “Negative trade balance is not always negative. It should be seen in the broader context” said the Head of the Chancery of the Pakistan High Commission in Sri Lanka, Balal Akram.23 While the share of Sri Lankan exports to Pakistan has shown a big jump – from US$ 44.86 million in 2004-05 to more then US$ 71 million in 2005-06, 24 Pakistan’s exports to Sri Lanka also reached US$ 214 million in 2007-08 from US$ 97.8 million in 2003-04 after the Free Trade Agreement became effective in 2005.25 It is far more mutually beneficial than the island’s trade dealings with India in which there are huge item gaps and wide exim margins. 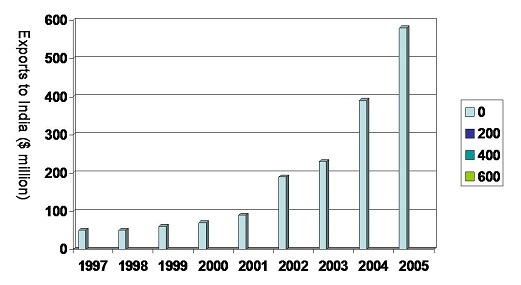 Given below are the two graphs sourced from the Central Bank of Sri Lanka’s Annual Report, 2005. 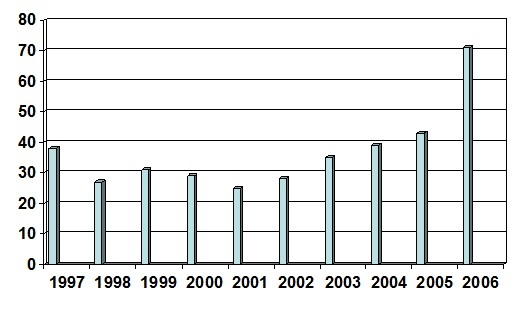 The first graph shows an unprecedented increase in Sri Lanka’s exports to India in a period immediately following the signing of the Free Trade Agreement in 2002. However, exports figures for preceding period with India were not very encouraging. The Pakistan graph shows that the level of Sri Lanka’s exports remained consistently high even before the Free Trade Agreement in 2005. A year after the signing of the Free Trade Agreement, the volume of Sri Lanka’s exports to Pakistan registered a steep rise to US$ 71 million, generating hopes among the Sri Lankan business community from their interactions with the Pakistani counterparts. Notwithstanding the impressive trade statistics, it is a matter of concern that some Sri Lanka’s products in which it has a natural advantage, like cotton textiles and apparels, tea and rubber, have been put on the negative lists of India and Pakistan.26 A quick look at the list of items exported to India and Pakistan shows a high concentration of vegetable oils, insulated copper products, copra and smoked sheets (natural rubber).27 This shows that the growth in bilateral trade is highly selective and not diversified. Sri Lanka has an excellent defence relationship with Pakistan, which provides the former with military hardware.30 During the course of Sri Lanka’s war with the Liberation Tigers of Tamil Eelam, Pakistan has emerged as one of the leading small weapons suppliers to the island nation. When Pakistan Prime Minister Shaukat Aziz visited Colombo in 2004, Chandrika Kumaratunga, then the President of Sri Lanka, expressed her gratitude for the assistance her country had received in the field of defence. Fonseka’s shopping list to the Pakistani military authorities were put at US$ 65 million under which the inventory for the Lankan Air Force alone was worth US$ 40 million.35 He had further sought 250,000 rounds of 60 mm, 81 mm, 120 mm and 130 mm mortar ammunition worth US$ 25 million and 150,000 hand grenades for delivery within a month to the Sri Lankan Army.36 It was also agreed that Pakistan will send one shipload of the items needed every 10 days to bolster the Lankan military efforts to take over Kilinochchi, the administrative centre of the Liberation Tigers of Tamil Eelam.37 According to Jane’s Defence Weekly, Sri Lanka had also made a plea to Pakistan to provide swift technical assistance for its T-55 Main Battle Tanks and C-130 transport aircraft.38 In 2006, in a bid to show their displeasure against the growing defence ties between Sri Lanka and Pakistan, Liberation Tigers of Tamil Eelam blasted a convoy carrying the Pakistani High Commissioner to Sri Lanka, Bashir Wali Mohamand, who narrowly escaped the attack.39 Four of his bodyguards were however, killed. The governments of Sri Lanka and Pakistan also select their envoys on the basis of the relevance of their background and experience to the prevalent needs of each other’s countries. In 2006 Pakistan sent Bashir Wali Mohamand, as the envoy, keeping in mind his experience as a Director General of the Intelligence Bureau (Pakistan) when the ethnic conflict in Sri Lanka was at its peak. In 2006, Pakistan selected another military man Air Marshal (retd.) Shehzad Aslam Chaudhary for the High Commissioner’s post so that he could function as hands on adviser to the Sri Lankan Air Force.42 For its part, Sri Lanka sent Air Marshal Jayalath Weerakody as the High Commissioner to Pakistan in 2009, when the tribal uprising was at its peak in Swat and other tribal areas. Such engagements have been more military than diplomatic, 43 as it was meant to help each other with intelligence and counter-intelligence operations. The spirit of cooperation and mutual bonhomie was again reiterated during a meeting between Pakistani Prime Minister Gilani and Sri Lankan President Rajapaksa on the sidelines of the NAM summit in Egypt in 2009. The meeting was the fourth in a year. Both the sides acknowledged the fact that Sri Lanka was not only a major recipient of armed forces training from Pakistan, but was also one of the main buyers of Pakistani defence equipment.52 Pakistan’s role as a major credit supplier to Sri Lanka was also recognized; the latter utilized the facility for buying railway wagons and defence products,53 mainly from China. Measures to promote bilateral interactions have continued to grab headlines even after the end of the ethnic conflict in May 2009. But a sudden declaration by the then Chief of Defence Staff, General Sarath Fonseka, calling off US$ 200 million arms procurement deal with China,54 as ordered by President Rajapaksa has put a question mark on the continuation of the post-war defence cooperation with China and consequently, with Pakistan. This has to be seen in a post-poll scenario, where the re-election of Rajapaksa as the President has a major role to play. His ability to balance the activities of India, China and Pakistan has been one of the major factors in his re-election, as opposed to the ‘pro-China, anti-India’ stance taken by his powerful rival, General Fonseka55 and his alliance. Despite several clandestine meetings and visits to India by General Fonseka, the alliance backing him, which also comprised ultra-Marxist JVP, remained more inclined towards China than India. Ranil Wickremasinghe-led opposition United National Party’s linkages with China are an open secret in Sri Lanka. It is common knowledge that China is one of the biggest arms suppliers to Sri Lanka and is currently engaged in building a big harbour in Sri Lanka at Hambantota. An unnamed Indian security source is of the view that since 2007, China has encouraged Pakistan to sell weapons to Sri Lanka and to train Sri Lankan pilots to fly the Chinese fighter jets.56 Like most of India’s neighbours, Colombo has been astutely cultivating China and Pakistan over the past decades, as a counter balance to India.57 Therefore, low key defense cooperation among Sri Lanka, Pakistan and China is likely to continue with the twin motive of safeguarding their own economic interests and keeping India’s so-called “hegemonic designs” in check. There is a need to have a fresh look at Sri Lanka-Pakistan ties in the new scenario, post- Liberation Tigers of Tamil Eelam conflict and the re-election of Rajapaksa. While the country will remember with gratitude the arms assistance it received from Pakistan and China in its hour of need, the return of peace to the island has radically shifted the focus of its needs and requirements. It no longer has any urgent need in the defence area and Sri Lanka knew how well to make its peace time choices. Rajapaksa made it very clear that Sri Lanka will continue to maintain its friendship with China and Pakistan and, although its relation with India is far more than a mere bond of friendship, he would like to deal with every country on the basis of Sri Lanka’s national interests. Nevertheless, the question arises as to whether a ‘sustainable relationship’ with India can be maintained on this basis alone, given the geo-political proximity and extensive socio-cultural links between the people of the two countries. While investigating Sri Lanka’s relationship with Pakistan and China, it can be said that, as of now, only strong economic ties can bind them together, particularly after the defence aid slid down following the defeat of the Liberation Tigers of Tamil Eelam. Pakistan may be Sri Lanka’s ‘true friend’,65 but the island will always look towards India for support and cooperation. On being asked what Sri Lanka wants India to do in a post-war scenario, Prof Rajiva Wijesinha, former Secretary General of the now defunct Secretariat for Conducting Peace Process (SCOPP) and Permanent Secretary, Ministry of Human Rights and Disaster Management, said that Sri Lanka wants India’s support to inform international community about the real intent of Sri Lanka, which is now concentrated on peace and development after the end of the civil war (Wijesinha, Rajiva 2009). Pakistan does not have the international clout needed to convince world community about the genuineness of Sri Lanka’s model of development, as that county itself is mired in various controversies related to human rights violation and terrorism. However, Sri Lanka is not expected to ignore China and Pakistan, and this reality even India accepts. India also recognizes that as a major world power China, up to a point is bound to have a role and influence in the region. Therefore, there is a need to give enough space to each other for carrying out their respective activities. India also is aware that while its ties with Sri Lanka will continue to be influenced by the ‘Tamil Issue’ and the ‘Tamil Nadu factor’, Sri Lanka-Pakistan/China ties are not subject to any such factor. Nevertheless, there is no justification for any apprehensions regarding Sri Lanka’s growing relationship with other countries, especially, with Pakistan. India should closely monitor the developments and do whatever is necessary to strengthen its own relationship with Sri Lanka. There is, however, no room for complacency in a fast-changing environment of the 21st century. India needs to be able to address Sri Lanka’s core concerns while ensuring its own. For more information, see the Sri Lanka High Commission in Pakistan website, (http://slhcpak.org/news/25-11-2007_SL_Pak.html). Subramanian, Nirupama. 2009. We won't allow isolation of Pakistan cricket. The Hindu: International (Chennai), March 5. The term 'multi-faceted' has been used in Sri Lanka and Pakistani media to describe the multi-level interaction between the two countries in various field. The News (Karachi). 2004. Pak Initiative Based on Sincerity: PM. November 22. Akhlaque, Qudsia. 2005. Sri Lanka President Arrives: Four Accords to be signed. Dawn (Karachi), February 5. Dawn (Karachi). 2004. Pakistan and Lanka Pledge Partnership for Peace. November 23. Khalid, Hanif. 2005. Pakistan, Sri Lanka sign Aviation Agreement. The News (Karachi). March 12. Pakistan Government, Ministry of Foreign Affairs. 2006. Joint Statement. Visit to Pakistan of His Excellency Mahinda Rajapaksa, President of Sri Lanka. Press Release No. 131/2006. April For More Information, see Pakistan Foreign Ministry website, (http://www.mofa.gov.pk/Press_Releases/April/PR_131_06.html). Masood, Alaudin. 2005. Pakistan - Sri Lanka: Strengthening Trade Links. The News (Karachi), April 11. Central Bank of Sri Lanka. 2007. Annual Report. Central Bank of Sri Lanka. 2008. Annual Report. Ghausi, Sabihuddin. 2007. An Emerging Trade Conduit. Dawn (Karachi), August 27. Baabar, Mariana. 2008. Pakistan, Sri Lanka Vow to Combat Terrorism Jointly. The News (Karachi), February 1. Syed, Baqir Sajjad. 2008. Sri Lanka, Pakistan to expand FTA scope. Dawn (Karachi), February 1. Ramachandran, Sudha. 2010. Diminishing Influence. Geopolitics, New Delhi. Warushamana, Gamini. 2009. Sri Lanka - Pakistan trade: Minor hiccups, major hindrance. Sunday Observer, November 8. For more information, see (http://www.bilaterals.org/negotiations/Srilanka) accessed on March 2010. Daily Mirror. 2009. Sri Lanka, President agree to boost multi-faceted bilateral ties. September 1. The News. 2006. Pakistan, Sri Lanka one on Fighting Terrorism. April 1. Baabar, Mariana. 2008. Pakistan, Sri Lanka Vow to Combat Terrorism Jointly. The News, February 1. Dawn. 2004. Pakistan and Lanka Pledge Partnership for Peace. November 23. Thaindian News. 2008. Sri Lanka's SOS to Pakistan for urgent arms supplies. April 2. Press Trust of India. Business Standard. 2009. Pakistan played major role in LTTE defeat. May 28. The News. 2006. Sri Lanka asking Pakistan for swift Military Assistance: Jane's. June 9. Ramachandran, Sudha. 2006. Had Enough? Tigers turn to Pakistan. Asia Times, August 16. Mir, Amir. 2009. Pakistan's crucial role in the death of Tamil Tigers. The News International, May 20. Also see, (http://thenews.com.pk) accessed February 25, 2010. Baabar, Mariana. 2008. Pakistan, Sri Lanka vows to combat terrorism jointly. The News, February 1. Tehelka. 2006. ISI uses Sri Lanka to spread violence in India- Jaffna District MP MK Shivajilingam of the Tamil National Alliance: An Interview with PC Vinoj Kumar. September 30. Kapila, Subhash. 2007. Sri Lanka looks to Pakistan for Military Hardware. PlainSpeak, February 3. For more information, see (http://www.boloji.com). The Nation. 2006. Pakistan, Sri Lanka vows to fight terror. April 2. Online Encyclopedia, Wikipedia. 2009. Pakistan Military Academy, Foreign Alumni. TamilNet. 2009. Pakistan's Navy Academy annually trains 70 SLN personnel. September 10. Sri Lanka Government. Sri Lanka Navy. 2009. Commanding officer of Pakistani Navy ship 'Zulfiquar' calls on Commander of the Navy. September 5. Also see, (http://www.navy.lk). India's National Security Advisor Mr. M K Narayanan in an interview with the media persons in Chennai after meeting Tamil Nadu Chief Minister M Karunanidhi, May 31, 2007. Kapila, Subhash. 2007. Sri Lanka looks to Pakistan for Military Hardware. PlainSpeak, February 3. Pakistan Defence Forum. 2009. Pak. Arms, Officers helped Sri Lanka rout LTTE: Report. July 6. Daily Mirror. 2009. Sri Lanka President agree to boost multi-faceted bilateral ties. September 1. Reuters. 2009. Sri Lanka cancels $200m arms deal with China, Pak. July 16. Ananth, Venkat. 2009. The Fonseka factor. Pragati, December 14. Pant, Harsh V. 2009. Shape of Sri Lanka's Future. The Japan Times Online, May 1. Ram, N. 2009. Rajapaksa says Indo-Lanka relations stronger then a mere friendship. The Hindu, July 8. Thaindian News. 2009. ISI could infiltrate through Sri Lanka: Chidambaram. February 25. Dr. Hassan Askari Rizvi. 2009. Email Interview by the author. December 31. Zee News. 2009. No defence ties with China: Sri Lanka. October 29. Subraminian, Nirupama. 2009. We won't allow isolation of Pakistan cricket: Colombo. The Hindu May 5. The Nation. 2008. Defence deal offered to Lanka. August 2.